If You Can Think It, You Can Watch It: Logitech Delivers Google TV to Living Rooms Across the U.S.
FREMONT, Calif. – Oct. 6, 2010 — Consumers today have access to an enormous amount of content, delivered by a range of sources and increasingly complex devices. To bring this content together through a single interface on the best screen in the house – the TV screen – Logitech (SIX: LOGN) (NASDAQ: LOGI) has worked with Google on a line of products designed to create the best Google TV experience for the millions of U.S. households with an HDMI-ready TV. Google TV brings traditional TV programming together with the entire Internet, with the ability to search across them both. Logitech today unveiled Logitech Revue™ with Google TV™, a compact, plug-and-play companion box with its Logitech® Keyboard Controller, which together provide seamless control over the Google TV experience and home-entertainment devices. The company’s portfolio of products for Google TV also includes the Logitech® TV Cam and Vid™ HD service for HD video calling from the comfort of one’s sofa. 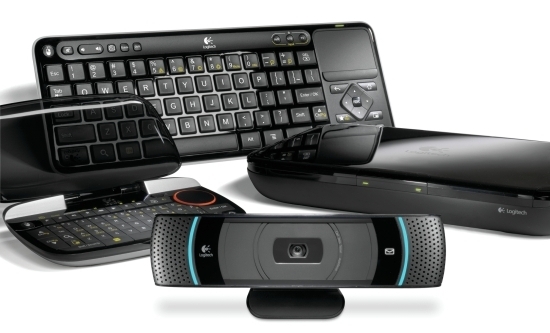 In addition, Logitech is offering the Logitech® Mini Controller for Logitech Revue as well as other applications designed for the Google TV platform. and a growing selection of apps,” said Ashish Arora, vice president and general manager of Logitech’s digital home products group. “Smart TV delivers a truly integrated experience, with broadcast and the Internet united on one screen,” said Wilfred Martis, general manager, Retail CE, Intel Digital Home Group. “The Logitech Revue brings Google TV to existing televisions, and also offers video calling to provide a new dimension to home entertainment. Once set up, you can use the included Logitech Keyboard Controller to navigate and interact with the new world of content available on the biggest and best screen in the house – the TV screen. Watching your favorite videos online on your HDTV is just the start. Pick up the controller, and type in anything you want to find. Watching the big game on live TV and want to know the latest stats on your favorite player? Simply use the dual-view mode to see the stats on the Web while still watching the game. Despite its compact size, just 6-inches by 3.5-inches, the Mini Controller offers full control over the Google TV experience. It has a touch pad that removes the need for a mouse, as well as illuminated keys that change color depending on the mode you’re in: green for navigation, orange for typing and pointing. Like the Logitech Keyboard Controller, the Mini Controller provides buttons to control your TV, A/V receiver and DVR. For added control possibilities, Logitech will offer two downloadable smartphone apps: the Logitech Harmony for iPhone and the Logitech Harmony for Android. These apps allow you to use your iPhone®, iPod® Touch, iPad™, or Android device to control your Google TV experience. With just one touch of the “Watch Google TV” button, both apps can turn on your television, cable/satellite box and A/V receiver. The in-app keyboard and touch pad make it easy to search for things to watch — online or on TV — as well as navigate websites. You can use gesture control, voice searches and much more. You can use the Harmony apps in place of — or along with — the keyboard-based controller that comes with Logitech Revue with Google TV. Available for pre-order today on Logitech.com, Amazon.com and BestBuy.com, Logitech’s line of products for Google TV are expected to be available online and in Best Buy stores across the U.S. by the end of October. The Logitech Revue with Google TV suggested retail price is $299.99 (U.S.). The Logitech Mini Controller suggested retail price is $129.99 (U.S.). And the Logitech TV Cam suggested retail price is $149.99 (U.S.).